Teach The Common in your classroom and receive discounted subscriptions, a free desk copy, and lesson plans. A classroom subscription includes two issues for every student, and an in-person or Skype visit from Editor in Chief Jennifer Acker or a participating author. Learn more about teaching The Common or contact us for more options. Supplementary materials for teaching Issue 07 are listed below. 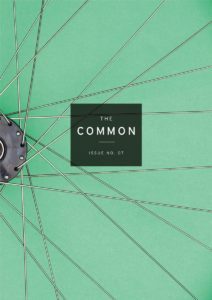 Listen to Editor in Chief Jennifer Acker discuss The Common, the role of place in literature, and the editorial process. Stephen O’Connor and Melody Nixon discuss dreams, the unconscious, and the right/ability of white writers to write across identity lines. O’Connor’s short story “Con” appears in Issue 07. Valerie Duff and Marni Berger talk about Mexico City, Virginia, Boston, and writing poetry as if you’re sorting through a dream world. Duff’s poem “Folk Magic” appears in Issue 07. David Breslin and Marni Berger discuss the American art world, how to handle painful subjects, and finding the ideal writing space. Breslin’s essay, “Plugs: Five Thoughts on Cady Noland’s Stocks,” was published in Issue 07. Katherine Robinson and Richie Hofmann discuss “Birds of Rhiannon” and “Little Chapel,” artifice, mythology, grieving, memory, and silence. Explore these collected resources on literary translation. See all of Issue 7.